If your business operates in the local area, within a state, county, city, town or community, then local SEO is something you should invest in. Local SEO has several benefits when compared to national or global SEO needs. One important example is competition, something in the SEO world we know a lot about. When you compete with brands on a national or international level, the competition is often high. When you compete locally, there’s less competition which means less businesses trying to rank for the same keywords as you. Local search engine optimization doesn’t mean the path to success is any easier, but for most, it will be. Point to note, if you’re in a large city such as New York or Los Angeles, you may find out that you have just as much competition. The results of your search engine optimization strategies will depend on a wide range of circumstances, which we’ll get into later. But for now, I want to focus on teach you what you need to know in our local SEO guide. Unless you’re looking to hire local SEO services, it’s going to be your responsibility to plan and put your local SEO plan into action. By now, you should know the basics of SEO. If you don’t, you need to learn the fundamentals first. Check out our SEO Guide. First, if you don’t have a website, you have to get one. Subdomains don’t cut it and a website is an affordable investment. Build your website in minutes. You need local SEO because you want your business to appear when potential customers are searching for your services or products. The very first order of business is choosing keywords. A keyword is any word. We offer local SEO services, so that term is a keyword for us. Since we want to appear when users search for local SEO services, we want to make sure we have a page on our website about local SEO services. And guess what, you’re reading it. Some keywords that you need to rank for are going to be directly related to your services or products. That is if you want to sell it. So some keywords are going to automatically fall in your lap. You want to perform keyword research so you know which keywords you’ll try to rank for. To research keywords, you’ll need to visit Google Keyword Planner. You’ll be able to use Google Keyword Planner to find useful keyword and phrases to rank your keywords. You will need a Google account to access it. You have two options when you land on the page. If you don’t know what keywords you’ll be using, then go to the top option. This will help you come up with keyword ideas. 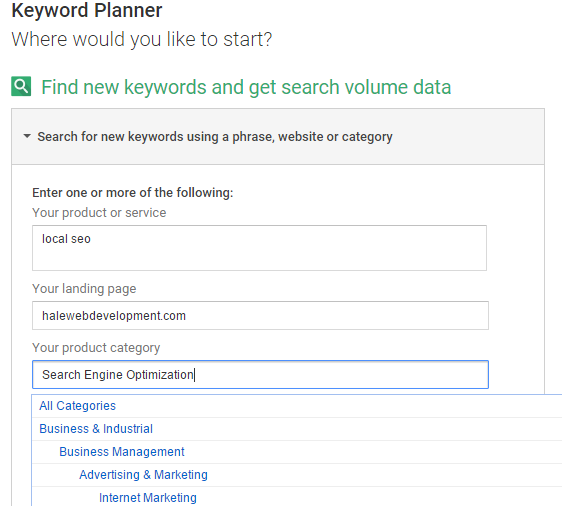 If you know the type of keywords you want to use, then you can go to the bottom option to look at the data of keywords, which will tell you the monthly search volume of keywords, competition level and how much the keyword cost if you were running paid ads with Google. The first option will allow you to search for keyword ideas. 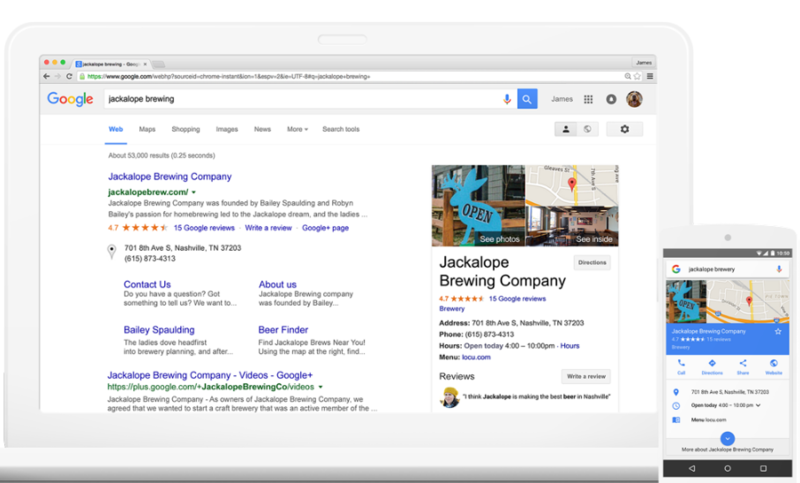 In our example, we’re using local SEO. We then filled in our website URL and chose our product category. You’ll see other options below this, most of them are for running paid Google ads. However, you do want to make sure the country is correct, which it is for the sake of this example. As you can see, Google Keyword Planner brought back a wide range of results for our keyword “local SEO.” Since we want to target and rank local SEO, we’ll be able to use more keywords that we may want to consider adding to this article or using at a later date. Above, we’re able to see the groupings of keywords. Local SEO brought back 50 results and those keywords have a total of 5,080 searches a month. We see the level of competition is medium. You see local SEO highlighted in blue, so we’re going to click on it to see our results. In this image, we’re able to see the top searches for our keyword “local SEO.” We see that local SEO services has the most traffic at 1,600 searches. All results are based on a monthly period or 30 days. We see that the competition level is high and to pay for this keyword, we’d have to pay $20.60 per click. The actual cost will vary, but usually it’s within a few dollars. Here’s the thing, can you afford to pay to pay $20 per click? That’s $100 for just 5 visits, $200 for 10 visits. If you have a great converting landing page, it could work. It would depend on how much that customer is worth to your business. Take Hale Associations for example. If we were to use paid advertising and we targeted local SEO as a keyword, how could we value each customer? 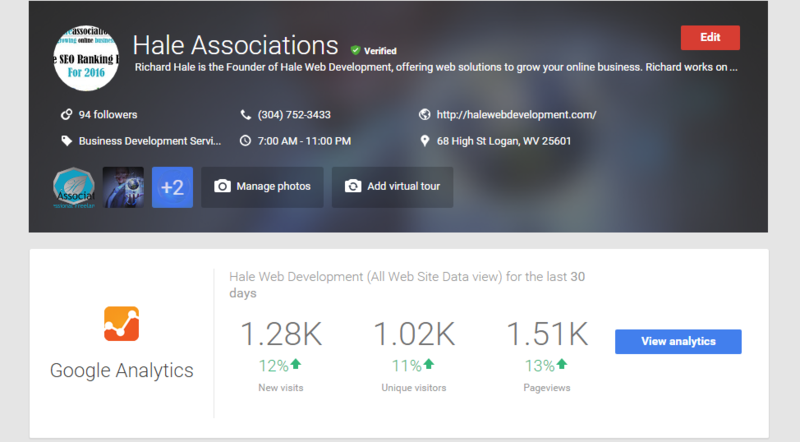 Our local SEO services start at $250 a month. We always use the base cost for this. So we’re trying to determine if it would be worth targeting this local SEO as a keyword. If we convert 1 out of every 5 visits, we’d have a conversion rate of 20 percent. We pay $100 and we make $250. Now, that would be worth it. However, if we only convert 1 out of every 15 visits, we’d lose money. We’re estimating paid advertising ROI. Now, if you have reoccurring monthly services, then you can take the early loss. But what guarantees a customer will pay for another month of services? You don’t know unless you have a contract. Then, you could evaluate what that customer is worth. It’s much easier with products. If you’re selling a book at $10 and you’re paying $1.00 per visit, you know you need a 50 percent conversion rate to make $5 per customer. (5) What Local Keywords Should I Target? Now, let me jump back to choosing local keywords to target. There’s 3 important things you need to make sure of when you target local keywords to use with your organic SEO. 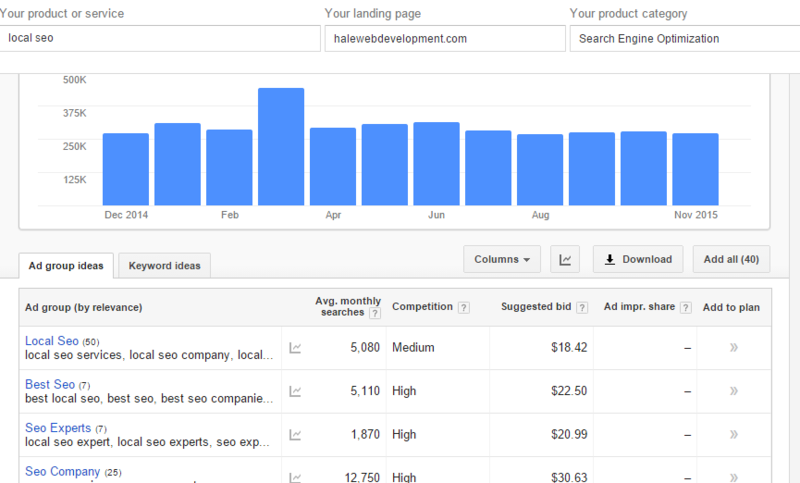 Now, local keywords will often have lower search volumes than some of the main keywords you may want to rank for. I’ll again look at our own company and the keyword “local SEO services.” Local SEO services has a search volume of 1,600 a month. If just look up SEO, we see a search volume over 90,000. Nearly all local keyword terms will follow this same role. Not always, but most of the time. Keywords with higher search volumes usually have higher competition. Why does competition matter when trying to rank a keyword? Simple, what they do affects you. What anyone does affects you when they target the same keywords as you. In the example above, we see 2 other keywords we may want to rank for and even these secondary keywords have more volume than local SEO services. Now, let’s look at an actual example. Let’s say you offer sales training and you live in Atlanta. “Atlanta Sales Training” could be a potential local keyword. So could “Sales Training.” While I would suggest you focus on both, which keyword is going to do you better? If you only offer services in Atlanta, then it would be Atlanta sales training. When we see the search volume per month, we only see 30 searches a month. Here’s why I wanted to use this example. You’re going to see keywords with search volumes this low. Should I focus on a local keyword with low search volume? Yes you should. For one, these are only estimates from Google. Rarely are keywords accurate. If you use Google Analytics and Google Search Console, you can track exactly how many people come through your website via search engines using a specific keyword. I’ve seen keywords that have search volume counts of 10 bring in 40-50 people. So remember that when you’re researching your local keywords. And this will lead me to what you need to do next. Once you know which local keywords you will target, you need to map them out prior. Practical Ecommerce shows us in the example above exactly how this can be done. You need to get an Excel sheet (just like above) or a Word doc would do. Map out all of your keywords. Here’s a very important tip, “you only need one page to rank for a keyword.” Each main local keyword should have its own home. You can add secondary keywords to your pages, but the best SEO strategy to use is one keyword, one page. This way, you don’t have your content fighting with other pages. Now, if you’re a local business, you may have only a little content to map out right now, but you still need to get it done. This will become your master copy. My business was once local, now it’s international. I really hope you have big dreams of going national, even international. If you do, then you’re going to need to rely on this content map. It doesn’t matter if you’re staying local or not, this comes in handy and all of your content should be kept in order. Using the reference both, we see that Practical Ecommerce has mapped out a page, URL and 3 keywords per page. One keyword is a primary keyword, which is the right method. One page, one keyword. Then we see secondary keywords. We see individual keyword search volumes and secondary keywords, as well as the totals for all keywords together. This is vital. All of your keyword selections should not solely be based on traffic volume. Rather, you need to make an effort to speak the language of your customers. Find out what they use to find someone like you. What do customers search for when looking for your products and services? What problems do your customers have? How can you help customers solve the problems they have? You’ll find great opportunities if you can include keywords and keyword phrases that your customers use. Google Keyword Planner is awesome, but you’ll find that if you want to find keywords that are not targeted by everyone, you’ need to search deeper. You need to dig into buyer personas to really understand your target audience and their needs. After nearly a decade of evaluating thousands of websites for SEO, one of the most common mistakes I see is content targeting the same main keywords over and over again. If you’re using the same keywords over and over again in your content titles, you’re going to have your own content fighting one another for rankings. Don’t want that. All you need is one page, one article to rank a keyword. This is another reason to map out your content and keywords. Another common SEO mistake I see is 200-300 word articles, Here’s the thing, if you’re looking for local SEO services, then you feel your SEO is not what it could be, right? Perhaps you’re a startup business or your website has no value. Due to this, you’re against all odds and you don’t have the SEO value to rank short content. If you cover a topic or subject, make your content great. Here’s how you can build high quality content that ranks in Google. If you write high quality content, users will be more likely to share your content. Many of the biggest companies in the world depend on content marketing to drive leads and business. Does content marketing work for local SEO? Of course it does. Just make sure you write high quality content and you’re targeting keywords that have traffic. What about targeting the wrong keywords? You bet, another huge SEO mistake that can cost your business before it ever gets off the ground. If you target the wrong keywords for SEO, you will fail. At best, you’ll hang around and won’t grow. Make sure you read my guide on choosing the right keywords for your business. One key local SEO benefit is going to be Google Business. This should be one of the first steps you take. You want to be in the good graces of Google from day one on. Google is your best friend, so be good to her. She can also be your worst enemy. Abide by her rules and most of you will enjoy success. Head over to Google Business and get signed up. You’ll be submitting your business information. You need a physical address because Google will send you a postcard with a code. You will have 30 days to confirm the postcard. Use the code you received, login and confirm your Google business page. This is a must for everyone, local SEO or not. Local citations are important for local SEO. While there’s thousands of local citation platforms online, not all of them are good for your business. We haven’t talked much about backlinks. No matter what type of SEO you do, you best believe backlinks are a major role. In fact, backlinks are the top Google SEO ranking factor. When you discuss backlinks, you begin getting into a lot of technical SEO. You start hearing about domain authority and link values. It’s a complicated subject if you don’t know SEO. None the less, most local citation websites allow you to build a link back to your website. This backlink is important. All backlinks are important, however, the value of that link can differ greatly. When you first start trying to grow your business, nobody really knows you exist. So local citations are a good start. You can list your business, some allow you to list products, some allow you to submit images and many other features. But you do need to be aware of what local citation platforms you use. Here’s a good resource list you use: Authority Business Directories To List Your Business. There’s nothing more powerful for on-site SEO than writing high quality content for your website. Just to clarify, on-site SEO refers to tactics, techniques and strategies applied to your own website. Off-site SEO refers to those same elements done off-site, such as link building, marketing, social media or PR. Look, millions of articles go published every day. If you don’t put your heart into your writing from day one, you won’t get anywhere in today’s SEO minded world. But you want your content to be the best it can be. Plus, let’s say you’re a doctor with your own practice, you want to be considered a thought leader in your industry. You want to build trust with your audience. I know some topics of content can be “boring,” hard to cover. But you can think of creative ways to write content. Use creative, unique, attention grabbing titles. Experiment using different techniques and track the results. You can always use platforms like BuzzSumo to see what types of content are popular at this moment. Once you have your content published and ready to promote, you’ll need to get it out there to spread the world. Perhaps you have a new product or service, or just trying to grow your local business. In my content marketing guide, I discuss everything you need to know about promoting your content and finding your target audience. There’s several reasons why content marketing is going to be important for your business. For one, content refers to many different things, not just articles you write. Many of us hear content and automatically think articles. Think outside the box, use different content strategies. Be unique, use different messages and test, test and test. Start a YouTube channel for your business and introduce videos. Start a newsletter to build your email list. Try podcast and see if your audience responds. I always try everything once because you never know what will stick. Make sure you’re tracking your results, time, effort and investment. See what any given content strategy achieves and if it does good, do it again. If it don’t, come back to it later or get rid of it. Content is everywhere and there’s always someone looking for it. It could be a service or product. If you have powerful content that adds value to someone’s life, there will always be interest. You just have to follow this local SEO guide and get the process going. There’s no better way to connect with locals than on social media. For one, nearly everyone has at least one social media profile. Facebook along has over 1 billion users. And when it comes to top tier social media platforms, none are bigger than Facebook. If you haven’t yet, go to Facebook and create a Facebook business page for your business. I know some of you may know how to use Facebook to market your business, others may not know. There’s a learning curve to learning Facebook marketing, but it doesn’t take a rocket scientist to learn. Facebook can be a major platform for your business. Most people have a Facebook account. But Facebook is only one of hundreds of top tier social media platforms with big audiences. You can use Twitter, Pinterest, YouTube, LinkedIn and many others to drive traffic to your business. In my social media marketing guide, I explain how to figure out which social platforms to use based on your business and industry. Be sure to check it out if you want to learn more. Social media has come a long way in recent years and now social media signals influence SEO. So you want to have social sharing buttons on your website. Make sure you also have your social media accounts on your site for easy access. You want to build an audience, so offer value relative to your business. I have to bring it up. I’ve been a SEO for 10 years. Let me offer some words of advice here, SEO is only part of the battle. I’m referring to local SEO, international SEO, national SEO, however you want to cook it. If you have traffic to your website, you should be converting that traffic into sales. Period. If you’re not, you need to look at your conversion strategy. You need strong call to actions on your website. Take Tru Conversion for example. When visitors come to your website, you want them to do something. This is known as your CTA (call-to-action). It could be a call us button, buy now button, learn more or a sign up. Take our popup for reference. Since we added this to our website, conversions are up 73 percent. Most websites will offer the user something of value to get them to take action. SEO can’t help someone to take action, but you can. One of my favorite conversion plugins for WordPress is Bloom. It’s affordable, well worth the investment. It allows you to create popups and other conversion forms. Learn about conversions, try different conversion methods and keep improving your systems. (15) Should I Use Paid Advertising With SEO? If you expect to throw an ad up and get the results you want, you’re fooling yourself. It can take time before you see success with Google paid advertising. You often to have to make consistent changes to keywords, ads and your landing pages until they convert at a high level and the ROI is positive. Just like Google, you can pay for Bing/Yahoo advertising to appear in their search engines. I don’t want to unfairly judge Bing and Yahoo, but when compared with Google advertising, I think the Bing/Yahoo network is less quality. From my experience, I’ve seen better results with Google. Just like with Google advertising, you can drive business to your website with paid Facebook ads. I’ve been a part of hundreds of Facebook advertising campaigns over the years and it can be very successful. Facebook advertising is cheaper than Google, Bing and Yahoo (in most cases). I know there’s a lot to cover in this local SEO guide. Be sure to bookmark it so you can return to it later. Please do comment, I love hearing your thoughts and suggestions. If you found it useful, please take the time to share it with someone that needs help. A lot of people get the idea that local SEO is easier and quicker. That’s just not the case, local SEO takes the same dedication and effort as national or international SEO. Sure, it’s a lot easier targeting a local audience compared to a national or world wide audience, right? We;;, depends on how you view it. With local SEO, your opportunities are less and you really have to reach a specific audience, often a small one at that. While common sense and data do suggest local SEO results are more achievable, you still have to put in the effort. So don’t think you have it made on easy street, you’ll end up landing straight on bum bum. In all seriousness, follow the steps in this guide and you’ll do just fine. Lastly, you want your NAP to be accurate and consistent. NAP refers to your business name, business address and business phone number. When you’re doing your local citations, make sure you keep your NAP the same. Using different addresses and numbers will confuse Google and your local SEO rankings won’t be strong as it could be. Due to this, you want to make sure you always keep login details for citations and listings.